Some photos of the Wind cave in the Mulu national park. 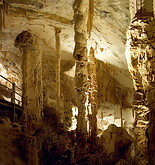 The cave is part of the Clearwater cave system and has many impressive stalagmites, stalactites, flowrocks, helitites and rock corals. The impressive "King's room" is illuminated.